Can Your Child Answer This Simple Question? It’s a simple question and yet the answer so often eludes us. In today’s highly materialistic, hypersexualized, and unapologetically self-centered culture the answer given is usually relativistic. After all, isn’t it likely that your definition of happiness might differ significantly from mine? Of course, this is not what our Catholic faith teaches. Far from some amorphous concept that differs for each of us, the Church has consistently taught the same answer…and it’s the same answer for everyone. God made us to show forth His goodness and to share with us His everlasting happiness in heaven. To gain the happiness of heaven we must know, love, and serve God in this world. Now here’s a question for you: Does your child know this? If they don’t, you better make sure you teach them. We read constantly these days of Catholics who have fallen away from the faith. We are told that for every adult entering the Church each year there are six leaving. We hear repeatedly of programs and books geared toward evangelizing grown children who have since left the Church. This is a complex issue and indeed the solution is multifaceted. However, at the very least we need to ensure that our children know what it means to be Catholic and what authentic happiness is. My eighth grader recently addressed this very subject as part of an assignment for her religion class. Homeschooled (as are all the kids), she is currently using the series Our Quest for Happiness from Lepanto Press. 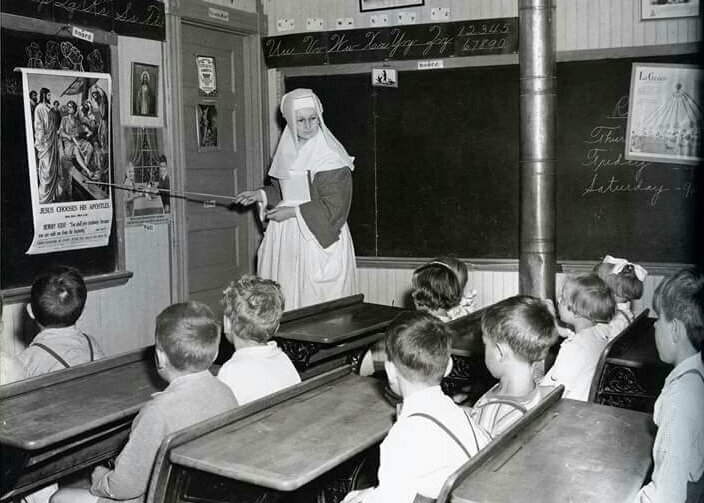 The series itself was a staple of Catholic high schools in the 1950’s. “All men seek true happiness. Only through God can true happiness be found. We need more than earthly success and possessions to gain true joy. We have a great need and capacity for happiness and goodness, and only God will fully satisfy that need. God is everything and so, if we lack God, we lack everything. “The secret to true human happiness is God and His infinite goodness. He can fill a void in our hearts, not just temporarily, but forever. God loves us, and wants us to be happy here on earth during our short time here. This is why the happiest people are the ones who use their mind and body for the greater glory of God. Posted on September 1, 2016, in holiness and tagged Baltimore Catechism, happiness, Our Quest for Happiness, secret to happiness. Bookmark the permalink. 4 Comments. My 6 yo knows this 🙂 Every night at bedtime she wants to hear the Adam and Eve story. I always tell her that God, perfect in himself, wanting nothing, created us to share his happiness. Usually we pray together that we might know Him more so as to love Him more… to which I sometime add that we hope to spend eternity with Him, to adore Him, along with his angels and his saints. When she was younger my explanation was shorter though : the secret to happiness is to obey – which is what we all need to do: to repair disobedience by obedience. The Baltimore Catechism used to be published for different levels in school. I’d always look forward to the next year’s edition. The year-after-year repetition on an ascending scale of understanding helped me. When I became a Catholic school religion teacher, I had to use different texts-not Q & A-but I found that my constant repeating helped my students. The idea that once a person is exposed to learning something, and takes a test to prove knowledge, and that is enough, is IMO, wrong. The spiritual comfort of understanding a homilist when he talks about the Spiritual and Corporal Works of Mercy is a grace and an intellectual joy. Secret of happiness? Strange question. Secrets are guarded. Not told. Answer this: was Jesus “happy”? Nope. Think of all the words used to describe Jesus …. Happy is not there.